hello! this post continues my series (which will hopefully go on for a very long time) of guest bloggers. i’m slowly trying to introduce more sections to my blog, so please let me know if you’ve enjoyed it! so, this time it’s the lovely jasmine from jazxo, another blog i always make the time to look at. she wears such beautiful outfits and has the most adorable pet bunny! seriously, you guys, you will die when you see it. too. much. cute! i was so excited when i saw that helen was asking for people to guest post on her blog as i love her blog and thought it’d be a great opportunity! i hope you guys enjoy this and don’t miss her too much. thanks a lot for this helen! i am absolutely terrible with coats. every single year i go out looking for one, get overwhelmed by the prettiness of one that’s so not practical, the fluffiness of another and the bizarre ones like this one just throw me off. then i find the perfect one and it’s £300. can’t win! 1. miss selfridge faux fur collar coat (here)– i am all about faux fur collars, especially detachable ones! this heritage coat is so on trend and looks smart enough to wear as a blazer type item. it would be a timeless coat that you’d get years of wear out of. 2. topshop textured fur collar boyfriend coat (here) – topshop bought this coat out last year and it was popular with a few blogs i followed. i was pleasantly surprised to see it out again this year. looks so cosy! the collar on this is also detachable and would make an amazing scarf! the actual coat part is more like a very over-sized grandad jacket and would look lovely with a thin knitted dress and girly shoes. 3. topshop textured faux fur coat (here) – this caught my eye on the ‘new in’ section on the topshop website and i love the texture. it’d really ‘make’ your outfit but you really wouldn’t want to get caught in the rain in this one! 4. miss selfridge aubergine duffle trim coat (here) – this duffle is more of a ‘safe’ coat and is one style you will see worn pretty much every year. there’s a lovely on trend twist on this one thought with the bright aubergine colour! 5. topshop fur collar quilted biker jacket (here) – now i know this isn’t strictly a coat but you can’t beat a good biker jacket. in my opinion this is the perfect one! love the colour of the fur collar and it looks like it’d fit really nicely. 6. H&M beige faux fur coat (here) – this H&M number is so similar to a coat that topshop bought out last year and i reeeally wanted it! unfortunately it had sold out in my size though. the colour is very practical, you’d be lovely and cosy and the price is brilliant. 7. river island red tartan faux fur collar boyfriend coat (here) – maybe a little extravagant but this coat is three A/W trends in one. the tartan, leather and fur collar all go hand in hand, all it needs is some military style! 8. reiss lillyanne warm blush long bomber coat (here) – some could say this just looks like an ugly dressing gown but i actually think it’s really cute! you’d definitely have to have the right figure to wear it but it’d be good to add a pop of colour to your winter wardrobe. 9. H&M wool blend jacket (here) – this is similar to number 4 colour wise but i love the speckle effect on this one! i’m not a fan of the tie up belt around the waist though. 10. miss selfridge PU sleeve parka (here) – this is one of my favourites. it’s so simple but looks really effective! love that it has a furry hood too. i’ve been seeing leather sleeves everywhere this year and a lot of shops have their own version of this jacket. i have the Primark one and get so much wear out of it! 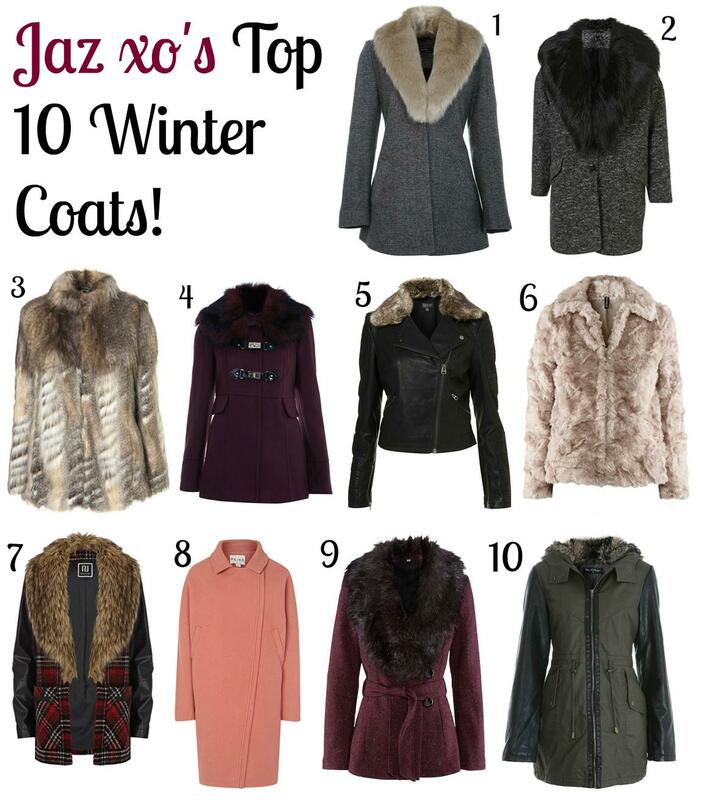 thank you so much to jasmine for doing this post, it’s really inspired me to buy yet more coats (damnit!). think my favourite is the river island one! don’t forget to check jasmine’s blog, it’s adorable! what do you think of her picks? would you buy any of them or do you have your eye on any other coats? ps. make sure you take a look at my giveaway! you could win 30 beauty products including essie nail polishes, soap and glory and loads more. take a look at my sponsors for this month: the lovely tribal blaze, which is an affordable and beautiful jewellery shop! you can get 15% off with the code ‘thelovecatsinc’ too! / barratts shoes have a huge sale on at the moment and free delivery with the code ‘sweet’. would you like to advertise or send me an item to review? take a look at my sponsors section to see how!